O/o Head of Respective Schools, Lakhimpur. 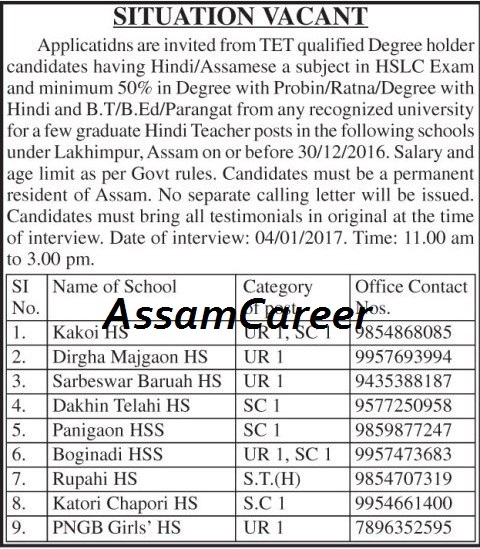 Applications are invited from eligible TET qualified Degree holder candidates having Hindi/ Assamese a subject in HSLC Examination and minimum 50% marks in Degree with Probin/ Ratna/ Degree with Hindi and BT/ BEd/ Parangat from any recognized university for a few graduate Hindi Teacher posts in the following schools under Lakhimpur, Assam on or before 30/12/2016. Date of interview: 04/01/2017 at 11 am to 3 pm.